SSG William R. “Billy” Wilson III was a true American Hero. 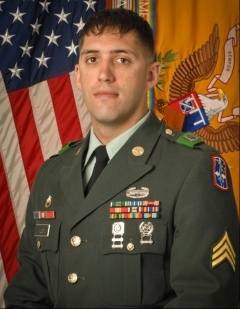 Billy was Killed In Action in Afghanistan on March 26, 2012. A graduate of Williamsville North High School, Billy joined the Army in 2005. Billy was truly a fearless man, but his courage was countered by his sense of humility, selflessness, and genuinely caring for other people, particularly his family, friends, and teammates. Billy’s death was not what made him a hero, but rather his life is–how he carried himself, how he treated others, how he lived life to the fullest while still constantly concerning himself with the needs of everyone else. These characteristics are what made Billy a hero and incredible person. Billy was a born athlete. Growing up he competed in anything he could including baseball, football, and basketball. Billy was on his high school football and basketball teams, but where he excelled was on the lacrosse field. Even in sports and at a young age, Billy demonstrated his courage and overall fearlessness. Billy’s fearlessness is well-exemplified by his experiences playing lacrosse. In Billy’s freshman year of high school, he was on the JV lacrosse team. That year both of the varsity goalies were unable to play. The varsity lacrosse coach walked up to the members of the team at a JV practice and asked if anyone there would be willing to step up and play goalie for the varsity team, which was desperate and in dire need of someone to play the position. Hesitant, everyone on the team took a step back, everyone except Billy. True to form, Billy, a 120 pound freshman, immediately stepped up to the challenge agreeing to play goalie for the varsity team. Billy did not care that he would be out there against juniors and seniors who were much older, bigger, and stronger than he was at the time facing shots with frozen balls in a position that was new and unknown to him. All that mattered to Billy was that he had been presented a challenge, and a group of people needed his help. Fear never entered the equation, just the satisfaction of helping the teams and challenging himself. Billy went on to play varsity goalie for three years and was named captain and starting center midfielder when he was a senior. Billy was an incredible lacrosse player, not just at goalie. In fact, he may have been better out of the net than in. But to Billy, he knew the team needed him and he was more than willing to do what was needed. Billy’s courage and fearlessness was only outweighed by his desire to help and care for others. One thing that made Billy a great athlete, and an even better person, was his ability to recognize the importance of things beyond his skill and athleticism. He knew that both in sports, as in life, greatness is achieved through teamwork, hard work, respect, accountability, and self-motivation. Billy knew that no one aspect of life or one single attribute would leave you successful, satisfied, happy, and accomplished. Billy’s courage was balanced with a genuine concern for the wellbeing of others, his skill was tempered with humility, and above all else, he attributed success to hard work and the help of others. These characteristics and personality traits directly attributed to the great soldier and leader Billy became. Billy was always a leader, one that was not hard to follow, as he led by example and had a great ability to motivate. Billy applied these skills and attributes directly to his career in the Army. Billy’s dedication, leadership, and overall sense of respect and care for others led to his rapid rise to the position of Staff Sergeant in the United States Army and to him being chosen as a Squad Leader in his Unit in Afghanistan. Soldiers from across the country met, and instantly came to love Billy. He made friends everywhere he went from basic training in Kentucky, where he was instrumental in helping fellow soldiers make it through, to being stationed in Texas and Germany, to serving multiple tours in Iraq and Afghanistan. Billy was so genuinely kind, gracious, and loving that these life-long friends he made could not help but soon become family to him. This was in large part due to Billy’s devotion to helping all those he could, no matter their situation or place in life. One could immediately recognize the genuineness and sincerity of Billy’s personality, kindness, and caring of others. While Billy was constantly concerned with the wellbeing of others, that did not prevent him from loving, enjoying, and living life to the fullest. From his love for all things motorized, particularly his motorcycle and Camaro, to his need for adventure, be it snowboarding, bungee jumping, or jumping off any cliff in sight, Billy knew how to enjoy life, and knew how to get others to enjoy it with him. Billy’s love for fun and people, coupled with his desire for all around him to have as good a time as he was, led to Billy being the life of every party and room he entered. Everyone loved being around Billy, and you could always tell and feel that he was looking out for you. A great soldier, an even better person, truly an American Hero.